In the previous post we looked at how to create a label and apply a policy. In this part we're going to look at how this will work in a real life scenario. First of all lets head into the Office Group we created, and look at the site collection overview. 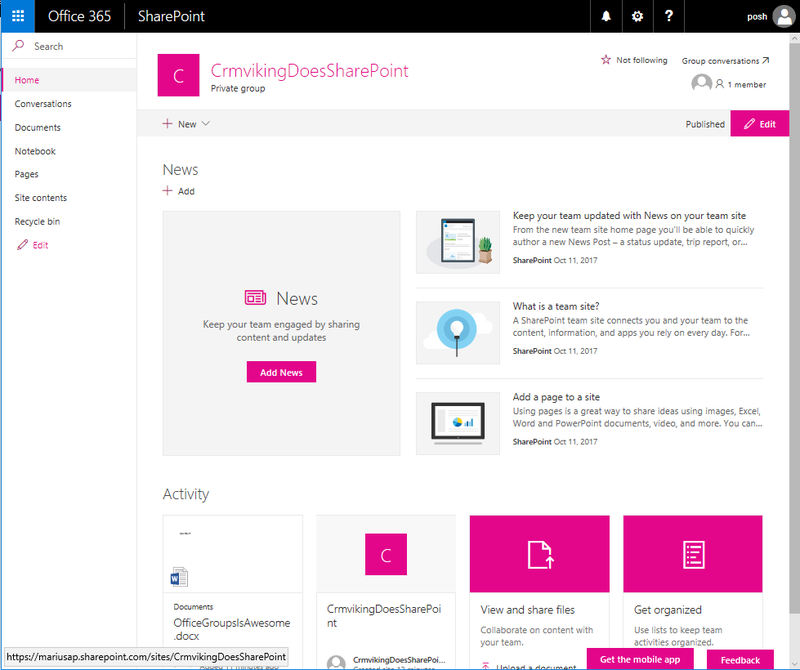 I'm saying site collection, because that's basically what it is, but unlike traditional site collections it's not available through SharePoint admin, and it has some extra settings to it. 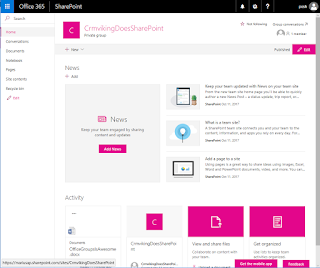 But don't take my word for it, check out Mikael Svenson's blog for a lot of amazing content on everything Office 365. Opening up the site we see that there's nothing special going on here. It's an empty landing page with the only activity being the creation of the group and the document we uploaded (at least I did). Going into the documents section, we find the file uploaded in the previous post (or you can just create a new file here). Click on the vertical ellipsis, expand the More category, and click on Compliance details. Click on the "None" link for the Label status. This will open a page where you can specify the label for this document. Go ahead and select the label we created in part 1, and then hit save. Now that we have a document with a label, let's try to see what happens if we try to delete it. Click the ellipsis and select delete, then click Delete in the confirmation box. Great, so that means the stuff we're saving cannot be deleted. We didn't select the checkbox for treating files as records (read-only), so we can still edit the document like we want. That's right, we're going to delete the Group already. 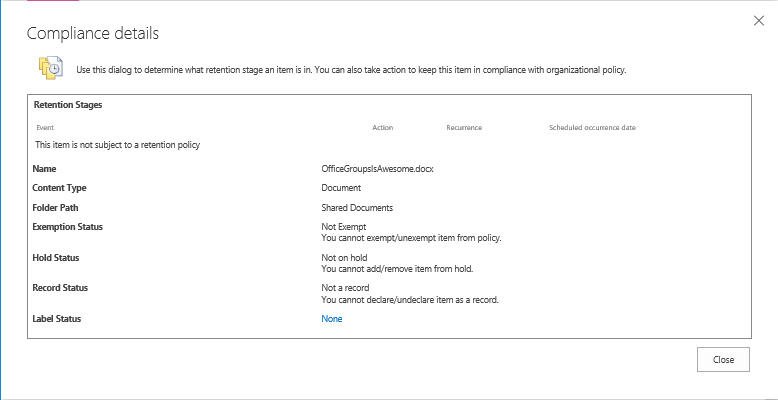 We now have a Group with one document in it, and the document has a label which says to have a 2 year retention after the last modified on date. Click on the cogwheel in the top right, then select Site information. 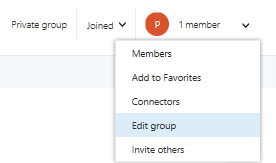 In the side bar, click on the Delete site link, and then check the box which says "Yes, delete this group and all its associated resources.". Now click that delete button and cross your fingers. 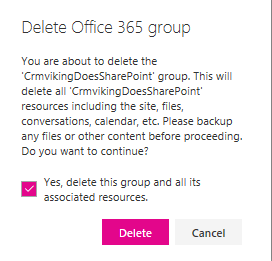 If your tenant is like mine, the group was deleted and you were redirected to the SharePoint root site. Let's take a look around to see if we can find traces of the group. 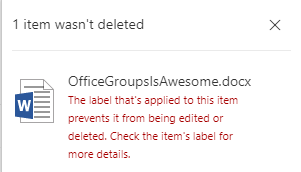 Going into Outlook we can see that the Group is still there, which is just because Exchange handles these deletions on a schedule that nobody® knows how works. I'm going to go ahead and delete it from Outlook as well. Click on the down-arrow in the top right corner, then select Edit group. Click on the Delete group link, and in the dialog window check the box stating "I understand that all group content will be deleted"
OK, now everything is gone? No, there's the the matter of the recycling bin. Unfortunately, deleted groups are not available through the UI, so you have to bring out some of your awesome PowerShell skills (or just copy the commands below). Now, I'm assuming you have a modern version of Windows with the possibility to install modules from the shell. If you don't, then you kinda have to do some internet research on how to install them for your environment. You will get a warning about the repository, I trust the repo so I'm choosing yes. If you don't trust this repo then I'm afraid this is the end of the line for you, if not select yes and continue. Group deleted, not a single warning presented. This means that the retention policy provided by labels does not prevent Groups with the content to be deleted. Wrap up: OK, this seems weird. So it seems that the retention policy set by using labels will prevent us from deleting files by mistake, but it certainly does not protect the site from deletion. I'm guessing that there's some sort of logical mishap on the server side, because why would you force an administrator to verify that no content inside a group is set to be archived? 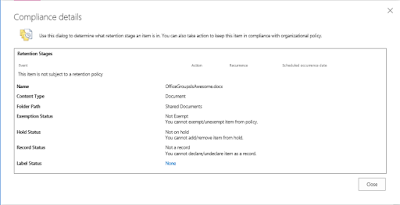 This tells me that the retention policies aren't quite production ready, and I have to find some other clever way to use Office Groups that helps reduce Outlook clutter while not deleting all content.